Sculpting the Multiverse, one card at a time. Just my luck. I discover there's a multiverse, and everyone else in it is still afraid of lightning. Baldred rides an enormous and fat battlecow. Under his mount, hundreds of heads of cattle are preparing for an stampede. "My turn to attack, robot. Let me prove if you can stand a front attack. Charge!" "Such hostility! You truly are a primitive lot. Tell me, do you still fear the storm?" When ~ enters the battlefield, you get . Pay , : Prevent all damage that one target creature would deal to you until end of turn. "You call it torture. I prefer freestyle electroshock therapy." 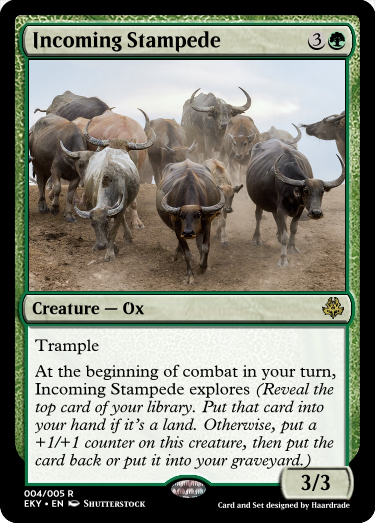 Incoming Stampede - 4/10. Feels very strong, even for a rare, as it will continually generate either land advantage or scrying at the beginning of each turn without needing to attack. Compare with Direfleet Interloper and Emperors Vanguard for the value WotC places on explore as a mechanic. Ratings aside, thanks for the attack! Hopefully this board is coming back to life. "Another metal man, huh? Maybe you'll be someone more entertaining, since the other one seems to not want to talk to me after my little... prank" says a young, pink-haired woman approaching "So what's your deal, metal man? Have anything interesting to bring to the table or shall I try to break you as well?" Destroy all artifacts. Discard your hand, then draw X cards, where X is the highest converted mana cost among artifacts destroyed this way. "My entire life's creation turned to dust in an instant... Well, better turn the page and start over!" "Why you little- get back here! That stuff is important! And what do you mean 'other metal man'?" Pay , : Return target artifact from your graveyard to the battlefield. All that's unmade can be reclaimed, if only you have the power. Workshop Collapse - 10/10. Feels like a very balanced, very flavourful, and yet very splashy. Could definitely see some play, beyond even limited in the right deck. A blonde lady flies in and lands on the ground. "Interesting. A creation of steel, yet one much different than the ones from my home. Further analysis required - perhaps even the opportunity to disassemble it could grant me profound insight." Destroy target artifact. Its controller searches their library for an artifact card with converted mana cost X or less, where X is that artifact's converted mana cost. That player puts that card onto the battlefield and shuffles their library. Exile Dismantle. "An interesting proposition. But I hope you don't intend to aim that thing at me. I have other, less valuable objects that you could disassemble." As an additional cost to cast this spell, sacrifice another artifact. "One man's prototype is another machine's spare parts." Dismantle - 9/10. An interesting design, which seems to be a "fixed" tinker. An interesting card with a lot of combo potential, for a reasonable cost. Cyria grins. "Ah, it talks, how lovely! I can make my creations talk as well." Until the end of the turn, noncreature artifacts become artifact creatures and all artifacts have power and toughness equal to their converted mana cost. A simple word with the ability to make statues rise and to turn machinery into warriors - "wake". Scavenged Servant - This is an interesting card along the same lines as Bloodrage Brawler, but I think it might be too powerful especially considering that it easily triggers artifacts with LTB's and can be played in blue, a color that doesn't even get 2/2's for 2, and doesn't even get a 4/3 for 4 without downside at lower rarities. I do like the flexibility the ability provides, though - 8/10. Nice card! Reclamation Forge: Refurbish costs 4, gives you the effect once and has a color limit. I believe this should be , cost 2 more and probably give you one less energy, because as-is, it looks really OP. 5/10. "Oh, you haven't met him? Yeah, there's this metalwork vigilante roaming around and thinking he's cool and all. I have to reckon he does seem badass... but it's funnier to make fun of him and poke his buttons. How about a fight to the death with him to see who earns the title of the one and only metal man?" Target creature you control gets +3/+0 until end of turn. It deals damage equal to its power to each other creature and each planeswalker. To a pyromancer, a "blaze of glory" is more than a euphemism. The robot pauses, and looks on in wonder as his constructs come to life. "Fascinating... some kind of nanobot reserve? Or maybe it's more of that 'magic' stuff I've heard so much about. Regardless, I have a little something that would love that." Pay : ~ get's +X/+0 until end of turn, where X is its power. Whir to Life - 9/10. A fun and splashy rare that would do well in Azorious artifacts. Looks fun, and fairly balanced. "Hmm, while killing an organic sounds like fun, I'll admit that getting rid of the one indicator of advanced technology in this cogforsaken place might not be the best idea. For now, I am quite content exploring, and learning more with every fight." When ~ dies, you get an amount of equal to the damage dealt to it this turn. Then you may pay any amount of . If you do, return an artifact card with converted mana cost equal to the amount spent from your graveyard to the battlefield. "Percussive maintenance, taken to it's ultimate logical conclusion." Out in a Blaze - 10/10. Falvourful to the extreme, and an actually balanced boardwipe based on what red normally gets. I think it's a good card, and you should be proud of yourself for making it. Reassembling Generator: Now that's a card I like. My only issue is its potential capability to chump really big threats while constantly bringing itself back and netting you additional energy on the process, since I've seen people do disgusting things with their energy. Still, 8/10. "Get in line, buddy, the people you'd really want to kill are probably on somebody else's death list, so get in line... You're not as fun as metal man, though... pity! I thought maybe you could entertain me, are you gonna disappoint me?" says Aylin with obvious contempt in her voice. Target artifact deals damage to its controller equal to its converted mana cost. He made a minuscule mistake in one of hundreds of equations. That was enough to end his life. Cyria inspects the construct. "Ah, how lovely! The design work on this is quite impeccable, I love the detail in the gears! I have a weapon that might be of some use for it." • Equipped creature gets +1/+1 until the end of the turn. Clockwork Lancer - This seems like a fun and improved variant on Electrostatic Pummeler - it costs more to cast, so it's not overpowered, but it's better against removal once it comes out because of the naturally high toughness. I also do like that it only boosts power, as one of the better parts of Pummeler was that it could easily dodge red removal and work around combat tricks with the ability, and I also like that it has the added advantage of costing less so that it's not as hard to start activating the ability. 8/10, nice job! "I'm sorry, am I not amusing you? Are my jokes falling flat? Well pardon me for not thinking much of your sense of humour. Let me search my databases for something funny." It paused for a few seconds, and an almost comical whirring noise issued from its speakers. "I'm awfully sorry to tell you this, but there is as yet insufficient data to provide a meaningful answer, because the only joke I have seen in this miserable backwater reality is you!" It glowed with pride for all of two seconds, before realising that the reference would go over the primitives head, as the work of fiction did not yet exist on this plane of existence. Grumbling, they set about fixing their systems, determined to make a better joke next time. , Sacrfice ~: You gain life equal to the life you've lost this turn. "Won't fix everything, but will save you in a pinch." Crafter's Demise - 7/10. Seems a bit niche, could do with a common rarity or instant speed, but seems good apart from that. This was unusual. The organic was offering it a gift. And not only that, but the gift was something... actually useful? It was like one of his augment modifications, except that it wasn't physically welded to it, meaning that it could be passed from one generation of automaton to another. Curious to further test it's capabilities, the robot set about creating a test subject, trying to distract it's mind from the daunting task ahead of it. As it sent the automaton clumsily staggering forwards, it grit it's metaphorical teeth, and vocalized something it had never before even thought in it's life. Spells that target ~ cost less to cast. Abilities that target ~ cost less to activate. The perfect crash test dummy. Invigorating Armament - 7/10. Could do with a power boost, as on most creatures it's just a four mana do nothing, but could be good in the right deck. The abilities seem balanced apart from that. Patch Kit: Really cool, simple card, perfectly balanced imo. I really enjoy that effect being brought up again! 10/10. Aylin chuckles at the robot's response. "Now that is new. You're a sassy one, aren't you? I like that..." she replies "I'm glad I pushed you buttons to bring that up. I get the feeling we'll get along as long as I can get you angry enough..."
Any number of target players each draw two cards and lose 2 life. 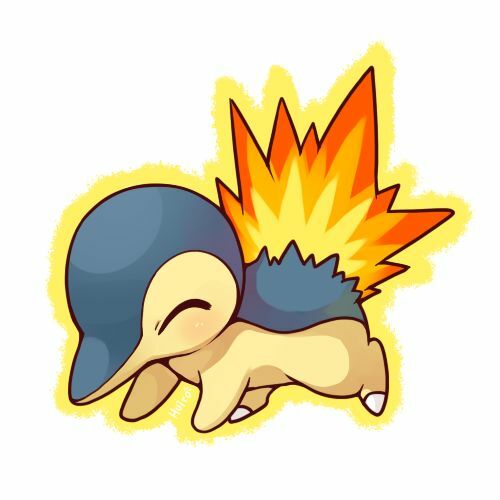 You see a slender organic approach... the stream of sparks spitting from its mouth and falling from its eyes is somewhat concerning, though. As it approaches, you feel a surge of electricity burn through you. Whenever enchanted player would put one or more counters on themselves or a permanent they control, they also deal 2 damage to that player or permanent. Will your addiction to cook you from the inside? Only time will tell! "Making me angry would not be a good idea. My emotions are artificial, and I'm in complete control of them. Anyone who says otherwise is obviously lying." The calm tone of the robot's voice somehow doesn't match the annoyed trembling of it's hands. Whenever you draw a card, gain 1 life. , Sacrifice ~: Gain 5 life. "The more you learn about yourself, the more they learn about fixing you." Blood Pact - 9/10. A good card with ton's of politics or combo potential. Ranked 9/10 because complexity issues aside, it could do as a common with it's power level. As the android's systems whirred up, it noticed a discrepancy. Energy generated also caused a small amount of damage to the generator. This was a strange problem, doubtless to do with that strange 'magic' stuff he'd been hearing so much about lately, and so a fix was already in the works. Humming and whirring, a solution spun itself from softened steel before his optic array. If you would take damage from a source an opponent controls during your turn, prevent that damage. Curse of Lightning - 5/10. Feels very niche, and a bit overpowered when it would be used. Could be nice in a combo deck or a specific draft environment, but apart from that just feels a bit specific. Fair enough. Let's see if I can do better next time. The sparks pouring from the organic's eyes intensified, burning small tracks into its skin. The "solution" melted itself into painful slag. Stealth Matrix feels off to me. On the one hand, the effects themselves seem fine... it's just that, other than Aegis of the Gods, every other source of "You have Hexproof" cost at least with otherwise niche benefits, and I'm not convinced that the second line is all that niche. I'd personally bump it up to , at the very least. I'll go with an 8/10 - I was going to rate it lower, but then realized that that's just my whiny burn/discard side talking. • Destroy target noncreature artifact. • Haywire Shock deals 2 damage to any target. The attack was powerful, but crude. It seemed designed specifically to destroy fragile constructs, or those that couldn't move out of the way. Luckily, he had been working on a little something to help with that. When ~ enters the battlefield, another target artifact you control becomes a Construct creature with power and toughness equal to it's converted mana cost in addition to it's other types. When ~ leaves the battlefield, sacrifice the targeted artifact. Haywire Shock - 7/10. Seems strong due to the whole choose one or both thing, but still an interesting design. Could do with one more CMC, or an uptick in rarity, but still a good card from a design standpoint. Medicinal Nanobots looks fine, not much to say about it other than I've been debating with myself whether or not it should cost rather than . 9/10. Aylin ponders the idea of artificial emotions: the sole idea of being able to control what she feels fills her with joy. But she knows that as a human being it is impossible, so back to meddling in others' affairs it is! "So you're completely in control, huh?" she ask mischievously "You can choose when to feel happiness... and anger... and fear and... surprise?!" Before finishing the phrase she kicks the ground with all her strength, causing it to crack and begin to shatter, the earthquake heading straight for the robot. Destroy all lands. ~ deals damage to each player equal to the number of nonbasic lands destroyed this way. Most kids like kicking stones around. Aylin did the same thing, but with boulders. The automaton felt a tremor run through the ground beneath his feet, and a sudden shock blasted through the earth. The very land around him was shuddering and shattering. Fortunately, in the moments before the earth beneath his feet was destroyed completely, it began to deploy it's masterpiece. If it had a mouth, it would be smiling. "Yes, as you have so astutely observed, I am in control. In control of my emotions, my machines, and the very world itself! Watch as the source of your mana bends to my will!" Lands are indestructible, have " : Add ", and lose all other types and abilities. At the beginning of each players end step, if all lands that they control are tapped, sacrifice ~. Indescribable power, drained of life and colour to serve the machine. Tremorous Impact - 7/10. Interesting, symetrical, and in colour. However, I don't really like mass land destruction, and I don't think wizards do anymore either. Interesting, but ultimately looks unfun to me. Essence Extractor: Pretty one-sided in the deck you want to play this in and, although you do give your opponent a way out, you're probably stopping them from casting any spells on that turn, although at five mana it's probably fine. Also, minor grammar error "All lands have indestructible" (don't worry though, I don' take points away for these technicalities). 7/10. "Great then" replies Aylin with a devilish smile "Then you probably won't mind me doing this..."
With uncanny speed, the geomancer rotates her wrists in specific movements, using the shards of shattered earth to create a massive spike and shooting it at the robot. , , Sacrifice ~ and another land: ~ deals 3 damage to any target. "So, you're the guy who's been stirring things up here lately? Word is you've got quite the supply of advanced tech, and we were wondering where you and it came from." "Ah, but we should introduce ourselves first. I'm Rettai, and this is Severin; we're with the Seventh Circle Initiative, an association of planeswalkers trying to keep the peace and support our fellow planeswalkers across Dominia. We're quite interested in sophisticated magic and technology, naturally, in the pursuit of those goals." Base Zero was getting tired. This... creature, was annoying them to no end, and seemed annoyingly persistent in the face of his greatest inventions. It seemed that the time was ripe for a change of tactics. "Ok. I will concede that you seem clever, and rather... humorous. I believe that we stand to gain more from cooperating than from fighting. What say you?" -- You gain 5 life. Each opponent gains 5 life. -- You draw two cards. Each opponent draws two cards. Crumbling Mesa: 8/10. Feels far too close to ramunap ruins for my tastes, but seems balanced beneath. A nice red uncommon. If it had the capability, Base Zero would blink. Other, seemingly peaceful planeswalkers? Offering him new knowledge and terminology? It was an androids dream come true, minus a few staticky livestock. "Well, funny you should mention that, because I can give you all the knowledge you require. In return, I merely need a few answers to some rather pressing questions: What is Dominia? What is Mana? And how on earth do you cast a spell?" The first time each turn an opponent activates an ability of a permanent they control, draw a card. Severin, Mad Devisor - 7/10. Not the best at rating planeswalkers. Seems a bit under-powered to me, but it is a rare good application of hybrid mana, which is nice to see. A good combo piece. notdaedalus—Interface Automaton: Okay, so this really wants to not trigger off mana abilities. Assuming you make that change, this is a cool hatebear and I love the design, but without that change it's quite frankly broken. Given that I assume you intended it to not hit mana abilities, I'll rate it a 7/10. "So, you're aware that we're in a multiverse: multiple parallel realities called planes, which planeswalkers can traverse via exertion of will. Dominia is the name of the multiverse—well, of this multiverse, anyway. There are others, and the planes within them can't be reached by mere planeswalking; they require other means of transport. There's actually a woman here from outside Dominia; she has mechanical wings. We're keeping an eye on her from a safe distance until we're aware of what she's capable of, but in the meantime you should consider her potentially dangerous. Her abilities don't function the same way magic here does." "Speaking of magic here, you wanted to know about mana—and honestly, your own technology could likely benefit from an understanding of it. So, almost all magic in Dominia relies on a form of energy called mana. There's five common types of it, which we associate with the colors white, blue, black, red, and green. Each has its own strengths and weaknesses. Mana can be extracted from the terrain; a planeswalker can form bonds with the land on each plane they visit, and then draw mana from it anywhere in Dominia, and perhaps even the multiverses beyond. Other mana lacks color entirely; it's generally less useful, only really usable for works of artifice or in combination with colored mana, but easier to synthesize artificially. You might have an easier time working with it, actually; I doubt you'd have a hard time setting up a device to produce it for you." "On your last point, spellcasting, I can't speak much to right now. Neither Severin nor I is a mage, but we work with a few very skilled ones; stop by our headquarters here and one of them would be happy to help you out." "Bring some of your devices with you when you do; I'm excited to take a closer look." Offering of Artifice: not a fan of this card. First of all, I think you could simply word it "each player gains 5 life" and "each player draws two cards" since I honestly see no substantial difference with each being simultaneous. Second of all, giving your opponent the choice since if I used this, I'd probably crack it at the end of my opponent's turn, so if my opponent chose the cards I'd be getting to use them beforehand most of the times, so I don't see the opponent choosing the cards unless they're really desperate to draw or have something like Consecrated Sphinx going on (in which case you probably don't want to crack this). Giving your opponent the choice when both options are so different in power, I highly doubt you'll be benefitted from playing this. 5/10. "I say the fun is over, then" says Aylin releasing the earthy weapon. However, she must admit that with Malextros approaching, she needs allies. Wasn't that the reason she began searching for the powerful ones? "I agree" she says "Maybe cooperation is the way to go..."
Just as suddenly as it began, the electrical surges faded and the organic seemed to lose interest. And then your memory banks (or equivalent) register a recorded message. Or two. Or twenty. > Greetings, Base Zero, and welcome to the Arena. I apologize for the shock - your circuitry needs more of a push than a nervous system for me to get my messages through. I do so dearly hope that I didn't damage anything too terribly important. My name is [edit: Kirino Oblay], and I hope you enjoy your stay. Remember to share your toys! Untap target artifact creature. It gets +2/-2 and gains haste until end of turn. "The idea is to apply more power. The secret is where." "...? Who in the empty void are you? And how are you accessing these systems? I assure you, they are well protected. And what manner of 'arena' do you speak of? Conflict is always fun." Pay , : Tap target creature you control. It deals damage equal to it's power to any target. Vigorspark - 4/10. Feels really really weak, as cards for just 3 CMC gives artifact creatures a permanent +2/+2. Switch to any creature and it would be a balanced card. "Hey, uh, rowboat? You here?" he asked into where he thought the thing would be. He vanished in a peel of lightning - why not appear in one too? "I've, uh... got a gift. And a couple questions, like what the Hell is going on in this place with planeswalkers and 'Mages' and 'Mana'?" When ~ enters the battlefield, you may search your library for an equipment, reveal it, then shuffle your library. Put that card on top of your library. , : Attach target equipment to target creature it's owner controls. "Ya need men to fight a war, 'tis true. But the right steel can substitute for a couple hundred." "Hey, robot man" says Aylin approaching "I remember you claiming you wanted to kill organic life. Well, I'm planning on doing just that, are you willing to help me?" , Exile ~ from your graveyard: Destroy target planeswalker. Base Zero blinked. The organic was offering it... a sword? Wait, it remembered this one. They had parted on amiable terms. Maybe amiable enough to ask of him a favour. "Aiden, wasn't it? Listen, I need a favour. This isn't my main body. Right now, that body is fighting an army who are trying to stop me from reaching a little girl in a hat. A hat which I know has it out for me. So, will you do me a favour by helping me out over there? I can reward you handsomely." Whenever ~ deals damage to a player, that player creates a colorless artifact treasure token with " , Sacrifice this artifact: Add one mana of any colour." "Getting paid for your suffering. Just like a normal payday." "I enjoy killing organics in much the same way you enjoy killing flies. I do not enjoy the killing itself, more the silence it grants me." , sacrifice ~: Change the target of a single spell or ability with a single target. "Actually, I think a curse upon your house will suffice." Call to Slaughter - 9/10. Can't really see anything wrong with this card, apart from power level concerns. I like it overall.